The 13.09 hectare Rollie Miles Athletic Field District Park, located in the Queen Alexandra neighbourhood, supports a number of community amenities and facilities including Strathcona High School; Queen Alexandra Community League; Edmonton Federation of Community Leagues office; Strathcona Pool; George S. Hughes Arena; as well as tennis courts, a 400m synthetic running track and several sports fields. Aging infrastructure and growing community demand have created the need for a renewal project for the area. 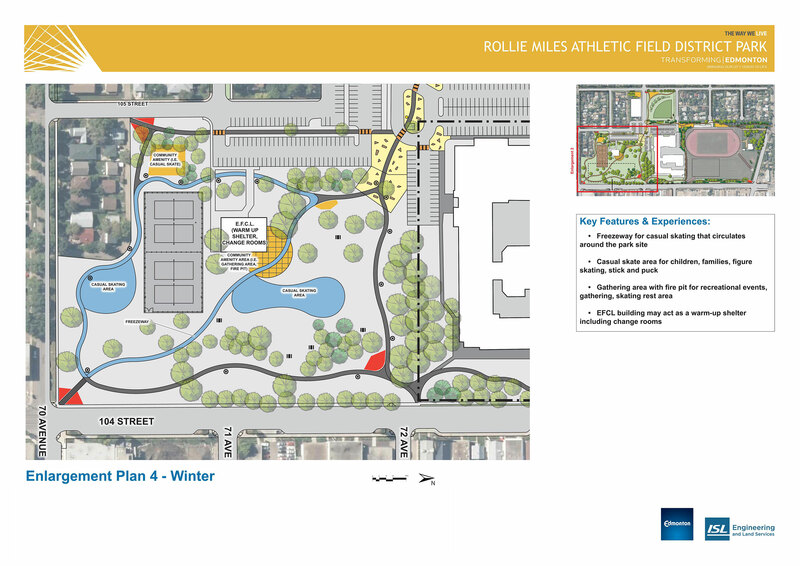 The Rollie Miles Athletic Field District Park renewal project will aim to identify renewal priorities and provide a long-term strategic approach through development of a park master plan. In this current phase of the project, the City is developing a functional program for a potential small Community Recreation Centre with an aquatic feature. The functional program will help inform development of a park master plan. Information gathered in this phase is intended to provide a better understanding of the needs for a new community recreation facility on Rollie Miles Athletic Field District Park. Approval and funding is still required. Stakeholder engagement to review information to date and preferred master plan option. Information is refined and a final master plan is prepared. The functional program will include the prioritized activities and services that could be included in a new Community Recreation Centre in Rollie Miles Athletic Field District Park. Collecting input from public, community advisory committee, and City staff which will be analyzed and used to develop a draft functional program. Reengage stakeholder committees to prepare for public engagement around development of a detailed program (functional program) for a Community Recreation Centre. Reestablishing the Community Advisory Committee that supported the Public Involvement Plan and engagement activities in the first phases of the master plan project. Complete Preferred concept design, technical site review, develop business case. Data analysis, concept plan development, assessment of internal opportunities and constraints. 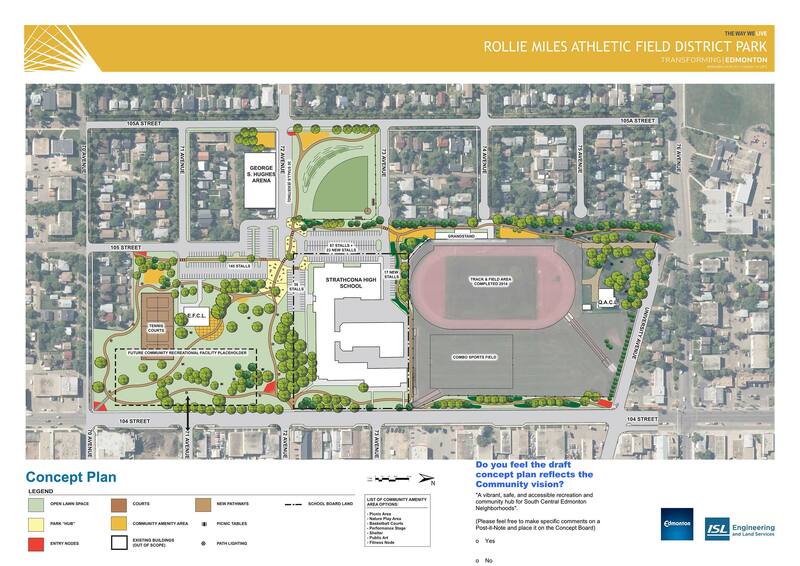 The Rollie Miles Athletic Field District Park master plan will include an assessment of the park's physical condition, demand capacity and functionality. The park renewal priorities will be based on community needs, public consultation, standards and regulations (accessibility, safety, health, sport and environment). Priorities may include utility replacements, improved circulation, access and parking, improvements to park amenities including sports fields, facilities, and required supports for park operations. The first phases of public input were completed in 2013 - 2016. Residents, park users, community organizations and other stakeholders identified how Rollie Miles Athletic Field District Park is used, community priorities and ideas for improving use. A draft park master plan was presented to City Council in 2016. They requested more information with the development of a Functional Program for a small community recreation facility with an aquatic element. The Functional Program will describe the prioritized activities, their spatial requirements and the relationship between spaces to support a small community recreation facility. An updated Park Master Plan will be presented to Council in Fall 2018. Where is Rollie Miles Athletic Field District Park? This small 13 ha district park is located in the rapidly densifying mature neighbourhood of Queen Alexandra, located in south central Edmonton. The Park runs parallel to Calgary Trail (104 street) between University Avenue and 70 Avenue. Is there more to Rollie Miles District Park than the running track? Yes, this site encompases a wide variety of amenities including a premier track and field facility, baseball diamonds, soccer/football field, tennis courts, George S. Hughes indoor skating arena, “Scona” swimming pool, Queen Alexandra Community League building and outdoor skating rink, the Edmonton Federation Community Leagues building and Strathcona High School. What is Park Renewal and Master Plan? Park Renewal includes upgrading or renewing infrastructure and park elements. Park renewal priorities are identified through developing a park master plan. A park master plan will look at the entire park to provide a strategic vision and action plan to address community needs and aging infrastructure. In 2015, the City of Edmonton began work with community groups and stakeholders to develop a park master plan for the Rollie Miles Athletic Field District Park to support community recreation opportunities and renew park amenities. A draft park master plan for Rollie Miles was presented to the City of Edmonton’s Community and Public Services Committee in September 2016. Edmonton’s City Council requested the development of a functional program report for a small recreational facility with an aquatic element to further understand the impact of a new facility on the district park. What is a Functional Program? A Functional Program is a report that outlines and describes prioritized activities for a facility. It includes the spacial requirements for each activity and the relationship between the spaces. The City will report back to Council in Winter 2018, with an updated park master plan that will include a recommended location for a small community recreation centre with an aquatic element, a facility functional program and an estimated project cost. Once the park master plan is approved, design and construction for the renewal of the park amenities can begin. How is the public being engaged? In 2013, the City of Edmonton began the conversation with the community to understand more about the recreational activities that are important in this District Park. During 2015 and 2016, there were a number of opportunities for the public to provide feedback and become involved in the development of a draft park master plan. In 2017, the City worked closely with the community, and together formed an engagement working group. The key responsibilities of this group are to inform the public involvement plan and identify opportunities for three engagement phases: Gathering Information, Exploring Options and Setting the Direction. As part of the Gathering Information phase, engagement activities include stakeholder meetings (May, 2017), community outreach (May, 2017) and a public survey (June, 2017). Engagement activities in the Exploring Options phase will include a public workshop and a stakeholder workshop (November 2017). To support our Setting the Direction Phase of public engagement we will be working closely with the engagement working group. What is happening with facilities currently located in Rollie Miles Athletic Field District Park? Scona Pool is the City of Edmonton’s oldest public swimming pool. The facility has reached the end of its life cycle and the condition of the facility continues to deteriorate. As facilities near the end of their lifespan, we need to make decisions about their future, which, in the case of Scona Pool, means closure. While the City continues to work through the park planning process for Rollie Miles Athletic Field District Park, the pool will continue to be operated through a partnership with a private contractor. The City will continue to perform routine maintenance to ensure the pool is safe for citizens. As part of a Council motion in September 2016, an aquatic element will be considered within the development of a functional program to explore a new community recreation centre at Rollie Miles. The Scona Pool facility is not expected to be repurposed when it is closed. Included in the current project will be development of a cost estimate to demolish the current facility. If Scona Pool reaches a point in service where it is inoperable prior to a new facility being approved or built, the City would work to accommodate demand from rentals or user groups for the time already committed. When a new aquatic season starts they would be incorporated into our existing booking allocation process to be accommodated at other facilities. George S Hughes arena is a facility booked city-wide for a variety of ice sports in the winter and concrete surface sports in the summer. The facility is booked for approximately 30 hours a year for public skating (2016-2017). The City of Edmonton’s 10-year Arena Capital Development Strategy (2009-2019) identifies the closure/repurposing of six aging arenas. One of the arenas identified is George S. Hughes/South Side Arena. Repurposing or removal of George S. Hughes Arena would occur after construction of a replacement facility. In 2015, the Dermott (Bonnie Doon) District Park Master Plan was developed identifying a twin pad arena location. Detail design and construction of this arena was not funded as part of the 2015-2018 capital budget, but this location is still relevant as per the 10-year Arena Capital Development Strategy. For the Rollie Miles project, the discussion of ice activities will be included in the Gathering Information Phase within the functional program development. The functional program project will include discussions on whether the existing arena could meet community needs through repurposing, demolition or a rebuild. All City arenas receive regular ongoing maintenance and repairs to ensure safety, and to maintain physical condition and functionality. The City is working with the Edmonton Federation of Community Leagues (EFCL) to determine what their operational requirements are for their work in supporting the 157 Edmonton community leagues they serve. The EFCL continues to be a key stakeholder in the project and the current facility the EFCL leases from the City will be reviewed for impacts. In Sept 2014, the newly restored Rollie Miles Track was reopened. This project included renewal of the track, drainage and field elements to provide a public outdoor track and field facility that can support a range of athletic opportunities to serve all citizens and stakeholders now and in the future. As part of the Building Great Neighbourhoods and District Park Master Planning consultation, residents in Queen Alexandra indicated that lighting on the path adjacent to Rollie Miles Athletic field was important. In fall 2016, new lighting was installed in the Park along the west path as part of the upgrade to the entire neighbourhood streetlight system with Neighbourhood Renewal. Additional park lighting may be considered as part of this park renewal project. Project approval and funding are not in place to begin design or construction of a new facility in Rollie Miles District Park. The current project provides an opportunity for the community and City to explore the size of a desired facility and possible location on this smaller district park site to update the Park Master Plan. We are in the planning phase. Will there be access to the new facility from Calgary Trail? This option will be explored during development of the functional program. Once a facility functional program is developed, the project will work on a site analysis which will include access and parking. Will a new facility increase the amount of traffic and parking in the neighbourhood? A new facility would be open to the general public. Traffic and parking will be considered during site analysis for his If a new facility is developed parking will be required. Edmonton Transit buses currently stop at this location. Will there be trees cut down to build the new facility? The proposed location of a new facility on Rollie MIles District Park site has not been determined. Once a functional program is developed, the project will work on a site analysis. Maintaining the trees has been identified as an important priority in this project and consideration of all factors will be discussed as the project progresses. Will the new facility be accessible ? The City of Edmonton is committed to improved accessibility of all City facilities for everyone. Features and amenities will meet the Alberta Building Code and take into consideration Universal Design Principles. Who will decide what is in the new building? The City will work closely with the surrounding community and public to ensure there is effective engagement for people interested in the project. There are many factors to consider in the decision-making process and the City will strive for the best understanding of the public’s views and perspectives. The City values public input when making decisions and is committed to communicating back how the input was used. This video provides an illustrative look at the process for renewing parks in the City of Edmonton, and how Edmontonians can get involved.